Give your hair hold and control for a bold polished look. 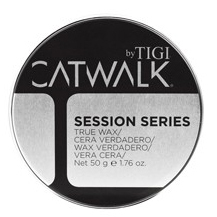 TIGI Catwalk Session Series True Wax is workable, so it allows you to tame frizzy hair and provides a pliable hold while adding sheen. A custom-tailored formula with a blend of vanilla and sandalwood will give your hair strong humidity protection for a long-lasting look.